Heat one tsp of oil in a frying pan.Add cumin seeds,coriander seeds,red chillies to golden brown color.Remove from the flame and transfer into the plate. In the same pan ,dry roast the peanuts,roasted channa dal and dry coconut powder individually until they each turns a few shades darker and release their aromas,taking care not to burn them.Turn of the flame and let it cool completely. Once all the dry roasted ingredients have cooled down,grind red chillies,coriander,cumin seeds,roasted channa dal.peanuts,dry coconut,salt and tamarind pulp grind into a smooth paste using little water.Stuffing is read. Take the eggplants stuff them with the stuffing paste . 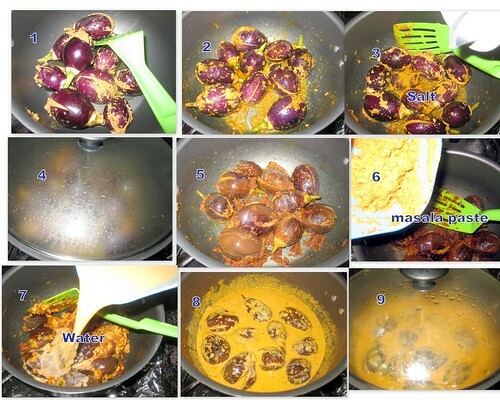 Heat oil in a pan and place the stuffed eggplants add salt mix well.They tend to splutter a lot,so cover the pan and let them cook for about 10 minutes,until they soften.Rotate them every few minutes so they cook evenly. 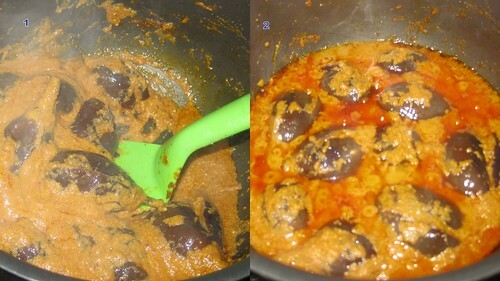 After 10 minutes add the remaining masala paste and one cup of water.Mix well,cover with a lid.Let it cook on medium heat until the eggplants are cooked through and the oil starts to separate from the masala and collect around the edges. 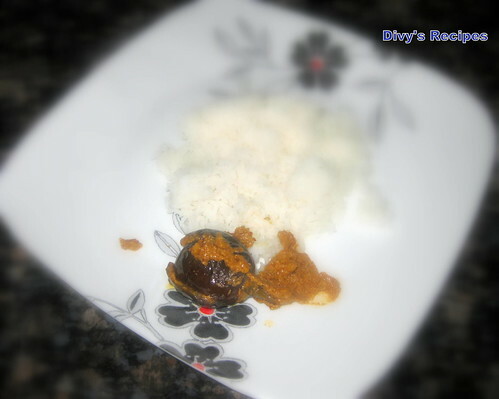 Serve warm with pulao ,rotis or white rice. 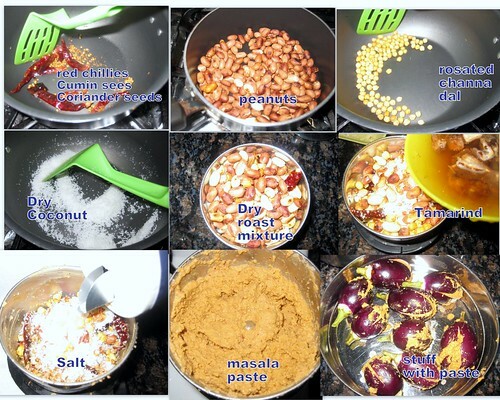 If u want more gravy add more peanuts,coconut and roasted channa dal. 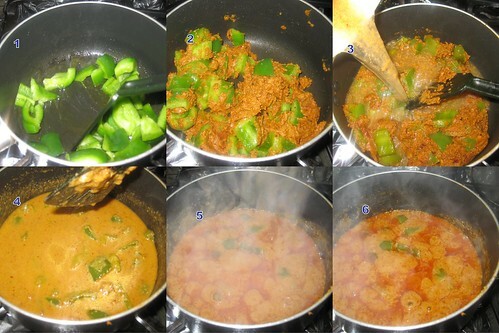 This masala paste with u can cook the bell pepper also. so tempting stuffed curry, loved it!!! 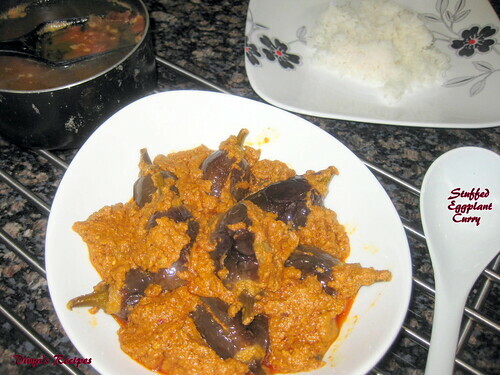 Brinjal cuury looks so spicy and yummy. 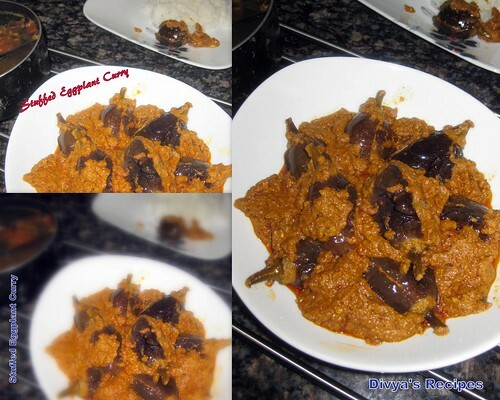 stuffed eggplant curry looks too spicy and delicious. 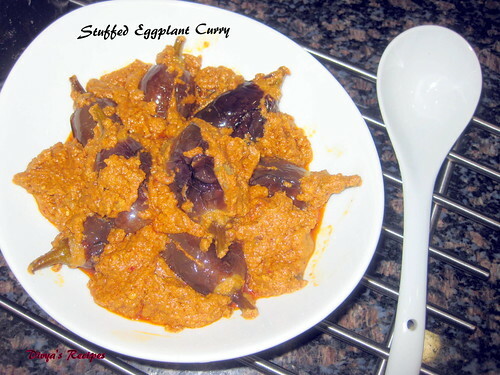 Yummy and delicious brinjal curry. Luv the flavor of peanut in it. Looks so yummy. Its like u read my mind...I have a stuffed eggplant dish waiting in my drafts! Will post it soon...yours looks so yummy! Wowwww am drooling over here.....wish to have with biryani!! so nicely done, looks very tempting..
Looks delicious, no oni & garlic verions are always welcome!! The gravy with oil released one!! looks fantastic! !